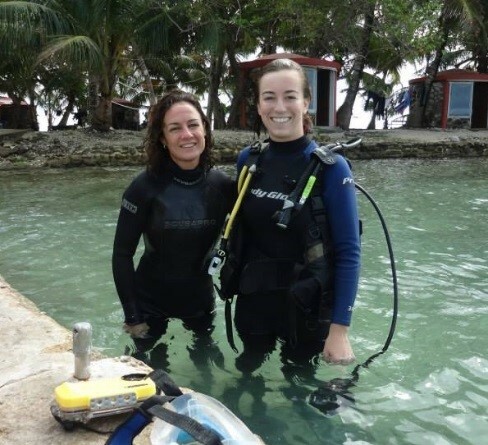 The following is a guest post from Aubrey Germ, an undergraduate student from John Bruno’s Fall 2013 Marine Ecology class at UNC-CH. I watched helplessly as a giant wave crashed over the bow of the boat, drenching my suitcase containing my possessions for the week. Rain was slicing at my face at 30 mph, my rain jacket serving no more purpose than to protect my skin from the sting. I looked behind me and saw that, even through the jarring pitches of the boat against the eight foot waves, the cartons of eggs stacked at the back of the boat were still intact. How could it be, I thought, that eggs, one of the most fragile foods on the planet and our breakfast for the week, are surviving this tumultuous, harrowing journey? What a wild storm! I felt like there was no doubt I was about to get whisked overboard into the blackened sea. 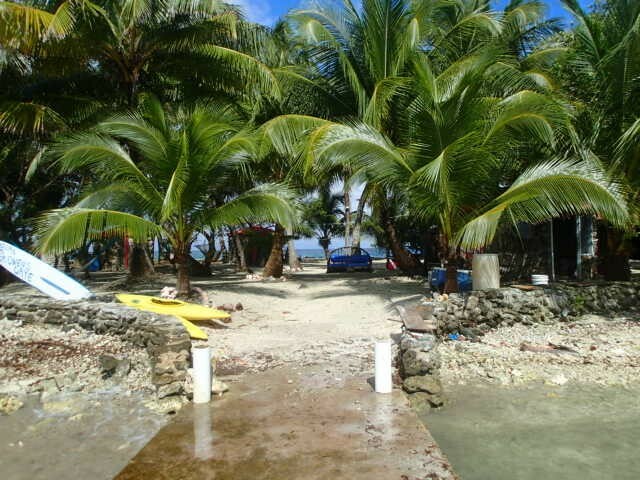 It still beats me, but somehow two hours later I finally found myself on the firm, sandy ground of a tiny Belizean Island known as Tom Owen’s Caye. If that was the beginning of my journey, I had no idea what else to expect from my week-long trip to volunteer with ReefCI, but I was positive the adventure would only continue! Me and my dive partner after completing a 1.5 hour dive surveying marine invertebrates! For a week this past winter break, I had the unique opportunity to travel to Belize to volunteer with ReefCI, or Reef Conservation International, a conservation SCUBA diving organization based out of Punta Gorda, Belize. The non-profit was founded by a woman named Polly and has since grown to become a very significant organization with a mission to help protect the critical ecosystems of the Belize Barrier Reef while also offering great diving vacations and experiences for its guests. 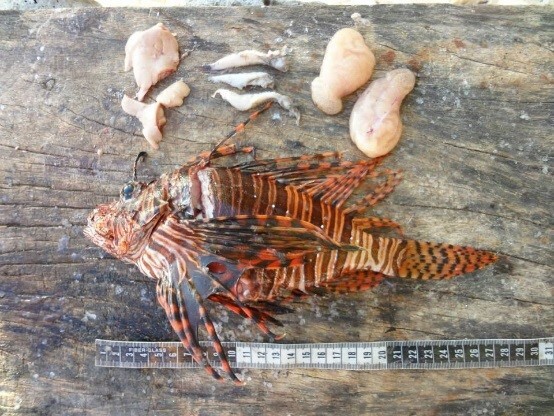 A dissected female lionfish with an excess of fat, a stomach full of fish, and massive egg sacs. The reefs of Belize are facing some serious threats, most of which are the result of human activity, and are problems not uncommon to marine ecosystems worldwide. Climate change, sedimentation due to coastal development, overfishing, habitat degradation, and pollution plague the coast. Most recently the introduction of the invasive lionfish species, Pterois volitans, has been creating huge imbalances in the ecosystem of Belize’s reefs. ReefCI works to combat these threats by offering a one-of-a-kind diving experience that allows guests like me to participate in valuable invasive species removal and data collection programs. The data collected by us ‘citizen scientists’ is recorded and sent to collaborating organizations like the Belize Department of Fisheries and other NGOs in Belize, and helps positively impact the host country and its resources. So, I speared those pesky lionfish, and subsequently measured, dissected, and ate them. I measured and sexed queen conch, participated in lobster, invertebrate, and fish surveys, and performed coral health assessments. I was simultaneously expertly trained to get my advanced open water SCUBA certification, and also became educated on sustainable, minimalist Island living. I should also mention the diving was amazing, and that I worked alongside fellow environmental and marine enthusiasts as well as beginning divers and people with no previous marine conservation knowledge at all. Needless to say, ReefCI offers an array of experiences for people of all types. People with a background in conservation will find it a refreshing application of their passion. People with no experience whatsoever in either diving or conservation will be able to quickly learn the technical aspects of diving and have their eyes opened to the issues facing marine ecosystems by participating in it firsthand. 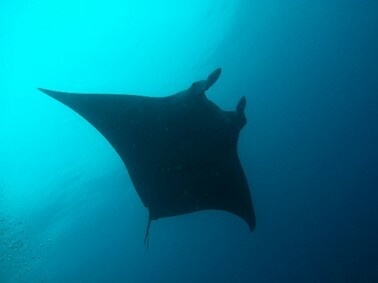 A 6 ft wide Manta Ray decided to make an appearance during our very last dive! Organizations like ReefCI should become more abundant. One should not have to scour the internet for hours to find such an establishment; however, they are out there for those who take the time to look. The potential for vacations like this, where guests are educated and give back to the local community while they simultaneously have the adventure of a lifetime and experiencing the magnificence of the world, is enormous. Make significant contributions to the world with your vacation time and look for places of learning and exploration. It doesn’t take a scientist or a motivated student to perform conservation work, or give back. Trips like this are an absolutely fantastic way for people to learn and spread the word about the critical issues our world is facing while enjoying the beauty that remains. Tags: Belize, Citizen Science, coral reefs, Lionfish, ReefCI. Bookmark the permalink.